Most home improvement projects are done by professionals and they can be done at the time of the home owner’s choosing. Unfortunately, when there is a problem on your home’s roof it usually needs to be taken care of right away. A roof leak can cause all sorts of damage to the inside of the home and it may seem like the home owner must act now in order to get it repaired. This can lead to many problems and poor decisions when it comes to your home’s roof. Since most roofing can last for decades this mistake can leave you with a roof that may only last a few years. There are some things you’ll want to consider before getting any type of roofing services in Howell Michigan which can ensure you get a properly installed and warrantied roof on your home. If the contractor asks for a suspiciously large down payment, there’s a good chance they might never come back after they get their hands on the money. By asking cash, the contractor could be committing tax evasion and might not even be a licensed business. As a rule of thumb, you should try to pay a contractor with a check or by credit card. Using a credit card is the best option because you have the most protection. It’s a given that fake contractors don’t have the knowledge and skills that legitimate contractors have. For this reason, you should be cautious if the contractor doesn’t seem to know what they’re talking about or performs low-quality work. Another giveaway is when the contractor doesn’t even have the proper materials to perform the job. Some contractors might offer an extremely low price because they claim to have “extra” materials. Contractors will often go door-to-door trying to pawn these materials off on unsuspecting home owners. Even if they really do have these materials, there’s probably a reason they are getting rid of them for cheap. More often than not, these materials are damaged and can’t be returned to the manufacturer. This is a common scam in the concrete business. Contractors advertise cheap asphalt but, within a year, it starts to crack. Fake contractors often agree to do a project for an agreed upon price and then try to up the price because of “unsuspected problems.” For example, you hire a contractor to fix ten loose shingles on your roof. Once they get up on the roof, they claim there is “extensive structural damage and mold,” and then promptly quote you an additional $3,000. While in some cases this might be a legitimate claim, it never hurts to have another company inspect it and give you a quote. Almost all cities require you to get a permit anytime you plan on doing a major construction project. Fraudulent contractors may claim that the city “will never notice” and that you don’t need a permit. Before you know it, you could end up with a hefty fine. Saying that you don’t need a permit is a major red flag. For residents of Howell Michigan, make sure you always get a permit and final inspection if needed on any home improvement project you have done to your home. To make sure you don’t end up falling for a trap, go with a reputable roofing contractor with years of industry experience. 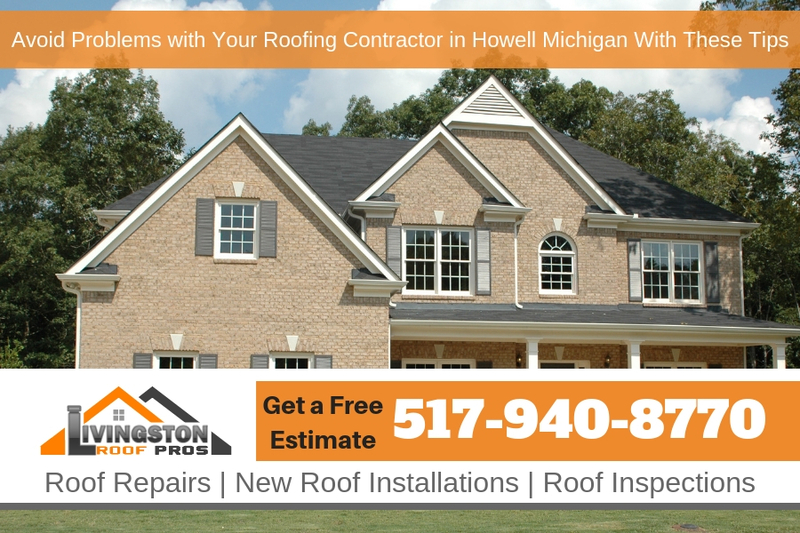 Call Livingston Roof Pros at 517-940-8770 for a free estimate.